In context: In Spotify’s most recent earnings report, it boasted that it had topped 75 million paid subscriptions. This accounts for nearly half of its total user base of 170 million. It also means that it is still the most popular streaming service available. Apple would like to change that. Tim Cook recently took a dig at Spotify because of its use of algorithms to curate playlists. In a sit-down interview with Fast Company Cook said, "We [at Apple] worry about the humanity being drained out of music, about it becoming a bits-and-bytes kind of world instead of the art and craft." Spotify’s algorithms take into account a user's play history and compares it to others to fashion lists tailored to the listener’s preferences. Cook says that Apple Music playlists are curated by humans making what users listen to more personal — he even used the word "spiritual." Spotify CEO Daniel Ek thinks this is nonsense. He believes algorithms can much more accurately select music that a user will like, thus giving each individual user their own listening experience. The best that human-curated playlists can do is appeal to a broader range of users. Some may like Apple Music’s lists and some may not. 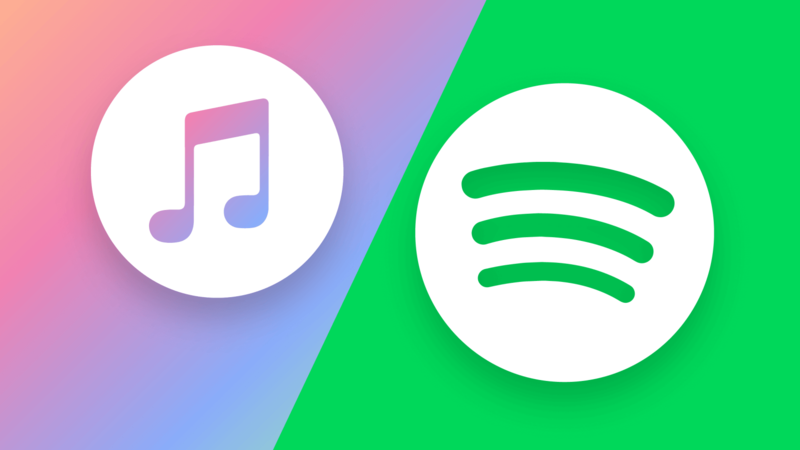 With Spotify, every user knows that "Daily Mix" lists will have music that they listen to frequently and that "Your Discovery Weekly" will have tunes that they may not have heard but will like because they are similar to what they already listen to. "Music is everything we do all day, all night, and that clarity is the difference between the average and the really, really good," said Ek. Putting curation aside for a moment and focusing on the numbers shows that Apple is in an excellent position to take the top spot in streaming music. Currently, Cupertino’s service has attracted about 50 million users with around 40 million paid. Spotify’s subscriber base is almost double that. However, Apple’s free-to-paid ratio is much more favorable at 1:4 versus Spotify’s 2:1. The reason that the ratios are significant is that ASCAP (American Society of Composers, Authors, and Publishers) and BMI (Broadcast Music, Inc) do not care about how much money a company makes from an artist’s music. All they care about is how many people are listening and that the company in question is paying the appropriate royalties. With Apple Music, Cupertino is only shelling out freebies for one out of every five of its listeners, and that is only on a temporary basis, not indefinitely. Plus, Apple doesn't even care about losing money in this venture. "We’re not in it for the money," said Cook. Apple can afford to be the "loss leader" in this race. Conversely, over half of Spotify’s user base is listening for free, so the company is picking up an enormous bill for them. It offsets that loss with advertisements, but the company is still hemorrhaging money. Spotify lost $1.5 billion in 2017 alone. On the bright side, since going public Spotify has attracted more paying customers and Q1 losses are down for 2018 to about $49 million. Personally, I like Spotify and am a paying customer. Even though I own an iPhone and have briefly considered switching to Apple Music, I have stuck with Spotify specifically because the playlists give me exactly what I want to listen to. Like Ek, I am not convinced that humans can make me a playlist that suits me perfectly.